John Kutzbach, a U.S. climatologist and professor of the University of Wisconsin-Madison, received here Tuesday China's top science honor for foreigners, the International Science and Technological Cooperation Award. "I am honored to receive this international science cooperation award... 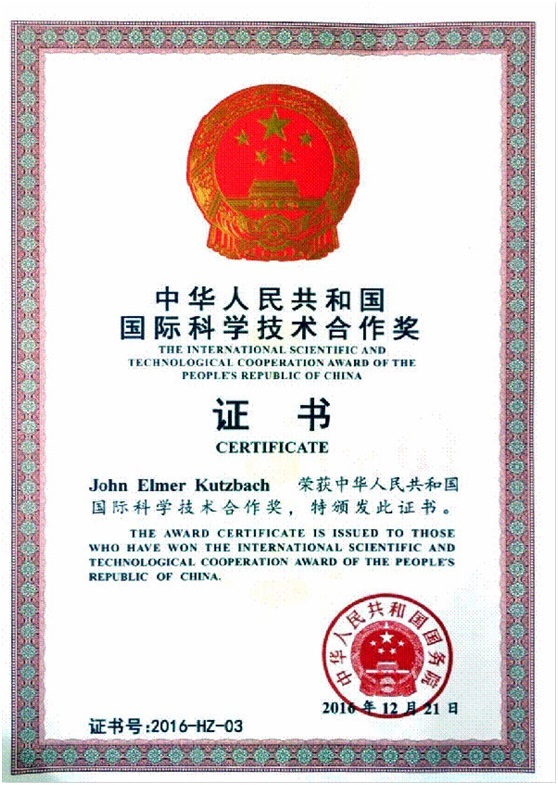 It's a great honor,"80-year-old Kutzbach told a special ceremony in the Chinese embassy in Washington, D.C.
Kutzbach was granted the 2016 award, along with four other foreign scientists and oneinternational organization, for helping hasten the development of China's research in globalclimate changes. But he did not attend the award ceremony held this January in Beijing because of healthreasons. On Tuesday, an emotional Kutzbach recalled that his 30-year cooperation with Chinastarted with a visit by two Chinese scientists to his university during a cold winter in the1980s. "You can't see the future very well. So I had no dream that our work together would leadto so much scientific accomplishment involving so many U.S. and Chinese scientists andalso deep friendships," he said. Kutzbach said this cooperation is "not something that has a beginning and an end" andshould continue under the Trump administration. "We are doing this not for our generation, but for the future of our two countries," he said. "It's my hope the strong scientific cooperation between our two countries will strengthenand grow." Cen Jianjun, minister counselor for education of the Chinese embassy, spoke very highly ofwhat Kutzbach has done for China's research on paleoclimate, or ancient climate on Earth. Cen praised the professor as an internationally recognized first-class scientist on climatenumerical simulation and one of the pioneers and founders in paleoclimate modelling. "In the last 30 years, Prof. Kutzbach has made a great contribution in promoting bilateralcooperation in scientific technologies and he selflessly passes his knowledge and wisdom toour Chinese scientists," he said. "I would like to represent the Chinese government toexpress our heartfelt thanks to Prof. Kutzbach." The ceremony was also attended by Kutzbach's wife, son and other family members as wellas his Chinese collaborators and friends. Kutzbach, born in 1937, is a long-term director of Center for Climate Research at theUniversity of Wisconsin-Madison. He was elected a member of the U.S. National Academyof Sciences in 2006. As one of the forerunners of paleoclimate modelers, he has studied the responding andfeeding back mechanisms in the simulation of changing Earth process throughgroundbreaking connections of climatology, geology and ecology sciences with numericalmethod of physics and bio-geochemistry. He has successfully revealed the mechanism and driving force of climatic environmentalchanges at various tectonic to orbital time scales. His findings have opened up a new direction for a deeper understanding of the past,present and future changes of Earth system.